You can increase the displayed page width in the Twenty Seventeen theme using the following “Additional CSS” (can be found under Customise > Additional CSS). To modify the percentage of the screen that can be used change this percentage **only** – the other percentages affect padding/ borders etc and will affect how appears on smaller displays. Enabling SSL within WordPress is not a simple task if you rely upon the “flexible SSL” offering from CloudFlare. You will end up with SSL infinite redirects and will likely be unable to get into your admin interface without editing config files. Getting this to work though, with the help of a plugin, can be relatively straight-forwards. That’s it.. browse to your site’s URL and confirm the traffic is automatically redirected to HTTPS. 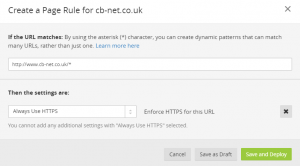 You do not have to change the WordPress config – to re-enable HTTP access remove the CloudFlare rule.